A king-sized version of our popular NY Strip Steak. 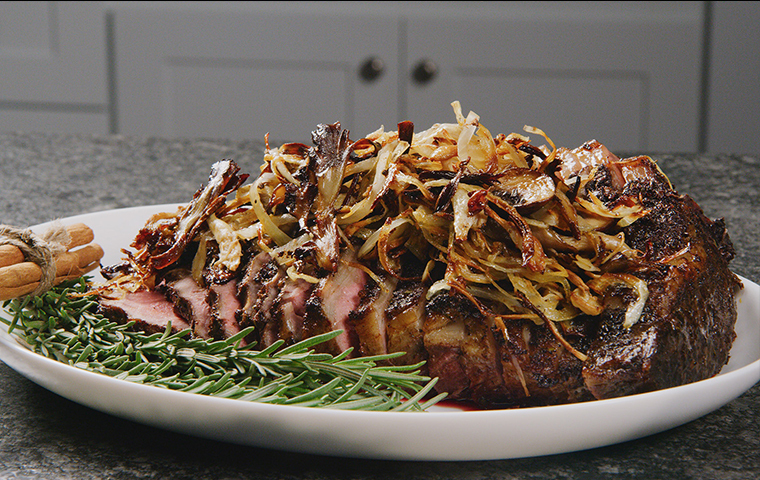 Extremely tender and well-marbled, the NY Strip Roast is cut from the short loin, a rarely used muscle. This cut is a favorite among cattle ranchers and is a top menu item at steakhouses worldwide. Cook it whole or cut into smaller steaks. 2. Place NY Strip Roast on wire rack laid on top of sheet pan. Roast in oven for 1 ½ hours or until meat thermometer inserted into thickest part reads 115°F. 3. Remove from oven, and rest for at least 30 min. 4. Preheat oven to 450°F. For medium-rare, roast for another 15 – 20 min, or until meat thermometer inserted into thickest part reads 125°F. Remove from oven. 5. Rest for at least 15 min. Slice thinly against the grain.